Gearbox's Randy Pitchford thinks that the people responsible for bringing PSN down are "cyber-terrorists," and that Sony needs gamers' support, not their scorn. Sony has taken a lot of heat for its role (or lack thereof) in the weeks-long PSN catastrophe, but Gearbox boss Randy Pitchford thinks that gamers' ire is misplaced. 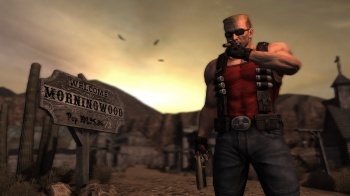 Speaking with Eurogamer on a tour to promote Duke Nukem Forever, Pitchford had some very harsh words to say about the PSN attack. "Every one of us who plays games on PlayStation Network - and especially Sony - we're all victims of cyber-terrorism," said Pitchford. "We should all be rallying our support, hating the terrorists, wishing to dismantle that problem, because that could strike at any time and disrupt our fun and disrupt our way of life as gamers." Instead, said Pitchford, gamers and press and even politicians had pointed fingers at Sony when the hardware giant needed support more than anything else. "It's freakin' terrible. [The hackers] are evil, they're criminal," he said. "We're all throwing darts at Sony - we should all give 'em hugs and help 'em out ... It's the first time we've experienced it in the games industry and I think we're failing in how we respond to it. Everyone who is attacking Sony right now is failing. We need to attack cyber-terrorists." What's more, Pitchford said that this attack could embolden others to do more like it in the future. I'm not entirely sure I agree with calling it cyber-terrorism, to be honest. That devalues the very real threat of real-world terrorism, and it's hard to compare not being able to play videogames online for a few weeks to fearing for your very life - even if publishers and developers have seen some fiscal troubles. Is it criminal? Absolutely. But "terrorism" seems a bit much.